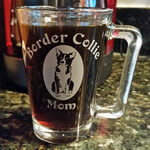 We offer many different styles of personalized pet related glassware that are customized any way you like - we have a wide selection of fonts and designs, and we specialize in custom logos and artwork. More information can be found on the links above or at the bottom of this page. Our production time is only two to three business days. We don't charge for production Rush service, let us know if you're short on time and we'll do our best to get your order out sooner (does not affect shipping time). If you have any questions, please feel free to call or email! 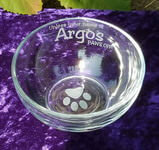 We offer several different styles of engraved cat and dog items that can be personalized your your pet's name - we have a wide variety of fonts (click on the Fonts link under Personalize above to view our standard fonts), we can use most Windows fonts if we don't have your favorite font listed, and we can use whatever layout you'd like. 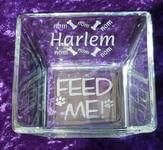 The personalized engraved cat and dog treat jars are the perfect treat storing container for your furry best friend! The treat jars are made out of glass with a plastic seal and a tight fitting lid. Price includes free text engraving on one side.